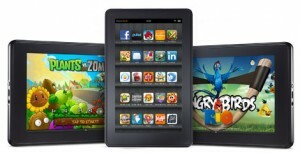 Is the Kindle Fire Hurting E-Ink Kindle Sales? Well sure, this shouldn’t be too surprising, but there are other factors to consider as well. First off, e-book prices have gone way up in the past year. Bestsellers used to be capped at $9.99. At that price, they were well below hardcovers, so I bought them all the time. Now they can be as high as $14.99. You can have a cheap e-reader to boot, but e-books with that high of a price makes the e-reader’s cheap price (almost) useless. I say almost because there are other options such as library lending, free or reduced priced books, or Kindle Daily Deals. Another thing is that we’re in that usual slow first quarter sales slump that is sandwiched between the holiday rush and the slew of new product releases that start showing up in the spring. Speaking of new product releases in relation to the e-ink Kindle. I will be interested to see if the rumored color e-ink is in the cards for the next e-ink Kindle refresh. If this does come to be, then it will give the e-ink models a much needed jump start. I love my Kindle Touch. 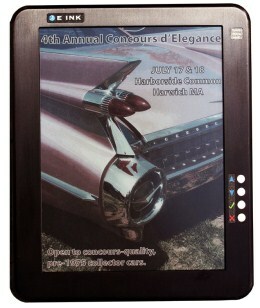 It is extremely portable, and allows me to enlarge the font to a comfortable size. But I have been using it less and less because of the rising e-book prices. I hope that one day soon, my local library will carry more bestsellers for the Kindle, and I also hope that a deal can be worked out to make e-book prices more reasonable. By producing the Kindle Fire, Amazon has shown that it is willing to move out of the realm of traditional e-readers to compete in the tablet market. This ability to innovate will be key to their success in the long run in terms of future e-readers and tablets. One of the things that I failed to mention in my previous post on CES Goodies was the announcement and demonstration of the first ever Color E Ink eReader. I’d like to say that this is the beginning of a trend that will eventually lead to a Kindle with color of some sort, but there are concerns to be addressed yet. Here’s where things stand so far. Hanvon, a company primarily focused on handwriting recognition and OCR software, known in the eReader marketplace for their WISEreader line of eReading devices, had a demo model for their new 9.7″ color eReader. There are any number of videos of it floating around the net. 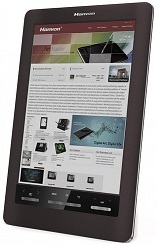 This new eReader is expected to be released in May to a Chinese audience at around $500. For what is effectively a first generation device, not a bad price, I suppose. The device will have a resolution of 1200×1600, the usual E Ink lack of constant screen refresh (this being what makes the battery life so much better than your typical screen options), and a resistive touchscreen capable of handling handwritten annotation and sketching. On paper, looks pretty good, right? The problems that I see at this point are two-fold. First, the screen is badly washed out compared to what users will be accustomed to. The lack of back lighting makes this somewhat inevitable, of course, but it’s more of an impediment to new users than it is a selling point right now. It could just be that Hanvon was not able to display the device to show off its best side, but you almost get the impression that the color will only be noticeable either up close or under truly bright light. The second problem is the refresh rate. I know I’ve been the first to tell people that complaining about that on an eReader is silly, but this seems to take it a little far. Average page turn time comes in noticeably over 2 seconds for every push of the button, including navigating the simple black and white menu. I do not get the impression that this is a product of the screen, from what I’ve been able to find, but rather a product of the GPU that Hanvon chose to go with for this model. I get that it’s a big screen and they’re trying to conserve as much battery life as possible and all that, but consumers have just started getting used to E Ink screens in their products now that the refresh rate is comparable to a page turn in a book. Nobody really wants to go back this far. Basically, I don’t see this one being competition for even the existing Kindle devices, and I can kinda see where Amazon(NASDAQ:AMZN) is coming from in not jumping on the color bandwagon the second a viable screen comes along. Sure, I’d love to be able to get color on a Kindle, or whatever they decide to call the new one when it comes out, but quality should take precedence over speeding to the release date. This will only be cool if it’s done right.